Avalokiteshvara (Tib: spyan-ras-gzigs), the four-armed bodhisattva of great compassion sits in vajra-posture upon a white moon disc and a multicoloured lotus. He is white like an autumn moon and his beautiful body is adorned with the five silk garments and eight jewelled ornaments of a sambhogakaya deity. Across his left shoulder is draped the skin of an antelope, which indicates his compassionate nature. His first two hands are palms-folded in anjali-mudra before his heart as he holds a wish-fulfilling gem. His second right hand holds a crystal rosary with a hundred and eight equal-sized beads. His second left hand holds an immaculate white lotus, which blossoms at the level of his ear bearing an unopened bud and a small fruit. The fruit, open lotus and bud respectively represent the Buddhas of the three times, past, present and future. His four arms symbolise the 'four immeasurables' of compassion, love, sympathetic joy, and perfect equanimity. Above his head is red Amitabha Buddha, the 'Lord of the padma or Lotus Family', of which Avalokiteshvara is the principal bodhisattva. 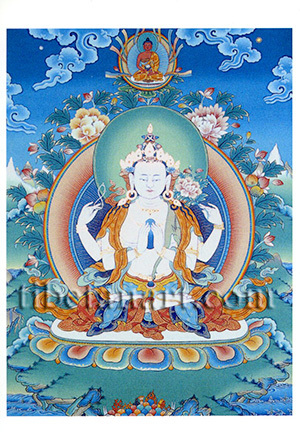 Avalokiteshvara is traditionally invoked by his six-syllable mantra, OM-MA-NI-PA-DME-HUM.